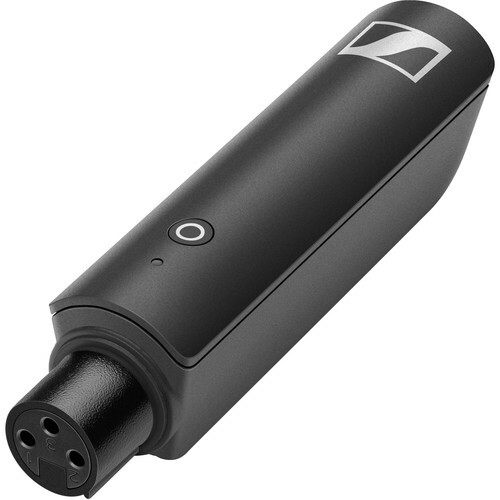 Part of the Sennheiser XSW-D digital wireless system, the XSW-D XLR FEMALE TX plug-on transmitter is available as an individual component when you're ready to add an additional transmitter to your system or as a replacement unit. Exceptionally lightweight and low-profile, the XSW-D XLR FEMALE TX features an XLR input connector ready to accommodate a handheld dynamic vocal microphone or battery-powered shotgun mic. This transmitter is designed to only transmit signal from a microphone (not from a mixer or recorder) and it does not provide phantom power. The XSW-D puts world-renowned Sennheiser wireless sound quality in a miniaturized, plug-and-play, 1-button digital system that anyone can use. Plug it in, power it up, and you're immediately up and running, instantly lightening your workload so you can concentrate on your performance. The 1-button, 1-LED concept with single-button interface and status indicator effortlessly handles power and linking tasks for you—without the need for any additional button pressing. Nothing ruins a take like hearing the weather report coming through your mic. Unlike traditional analog wireless systems, the XSW-D digital system operates in the 2.4 GHz ISM band, protecting the integrity of your signal from interruptions and drop outs caused by TV channels, radios, or other sources. Does this have phantom power? No, you need to use a microphone with a battery like a Ride NTG2 or NTG4, Sennheiser ME series or a handheld microphone, like the one used by news reporters.